The environment is now a national priority thanks to President Obama. This is probably one of the key changes instituted by the President, because green conversion is so important in our world today. Also, Dr. Chu has been appointed as Energy Secretary, so there is a lot of emphasis on R&D of renewable energy. The creation of many new jobs is another side benefit of this action. While the former administration chased around other countries in search of WMD and in locations where we would never locate Bin Laden, President Obama placed a high priority of finding the man that master minded the September 11th tragedy. He has continued this single task focused effort on the various high level members of Bin Laden’s organization with great success. 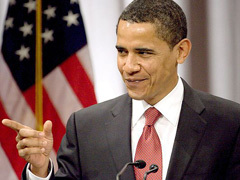 Working together with international organizations, President Obama encouraged participation in the ultimate removal of Gadhafi from his tyrannical throne in Libya. President Obama played a key role in slowing the recession down. People are no longer consumed with thoughts about recession and the economy seems to be gradually going into recovery. President Obama came up with a measured recovery plan, which contributed largely to the labor force transition with stimulus dollars. So, Obama’s U.S. economy plan worked quite well. 3 – The car industry is alive! Posted on May 11th under Global Ecology.